Overlooking Shades Valley and Samford’s campus, the Samford President’s Home on Shades Crest Road will be one of five homes on the Legacy League’s Christmas Home Tour. Photo courtesy Samford University. Journey from Palm Springs to the Mediterranean countryside, shop an assortment of gifts and snack on holiday treats – all while traveling less than four miles during the Samford University Legacy League’s Christmas Home Tour, set for Dec. 6. Featuring two homes in Mountain Brook and three in Vestavia Hills, the one-day holiday tour showcases residences of several architectural styles, décor, sizes and ages. 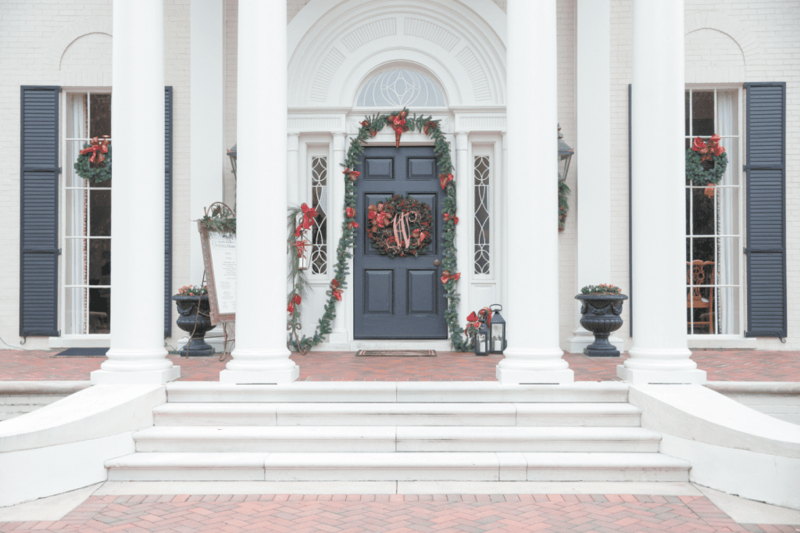 Now in its eighth year, the event, which is presented by ARC Realty, also includes a holiday gift market and seasonal treats served at the Samford President’s Home. The mission behind the tour is to raise scholarship funds for students who have faced serious obstacles on their path to higher education. 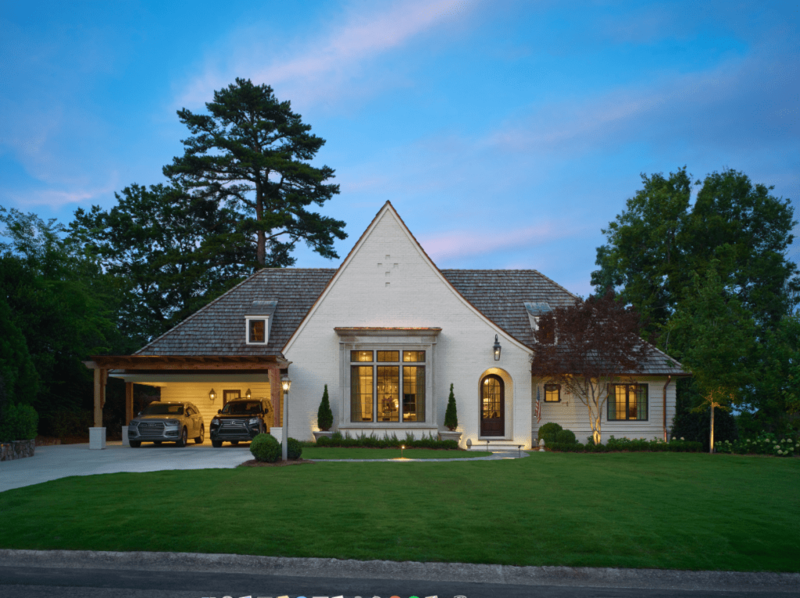 The Legacy League’s 2018 tour includes the Mountain Brook homes of Ashley and Trevor Kaple, 2940 Pump House Road; and Danielle and Bart Yancey, 2809 Pump House Road; as well as the Vestavia Hills homes of Ashley and Andy Prewitt; 417 Sunset Drive; Tracy and Robert Stephens, 216 Sheridan Lane; and Jeanna and Andy Westmoreland, Samford President’s Home, 1994 Shades Crest Road. The Kaple Home. Photo courtesy Samford University. Located not far off U.S. 280 near Cahaba Heights, the manor house sits on more than 3 wooded acres and has a pool encircled by stone. The home has old-world elegance and Mediterranean influences, though it was just built in 2005. The Kaples purchased the house in 2010, moving in when Ashley was 40 weeks pregnant. Six days later, their first baby girl was born. They have since added two more girls to the family. 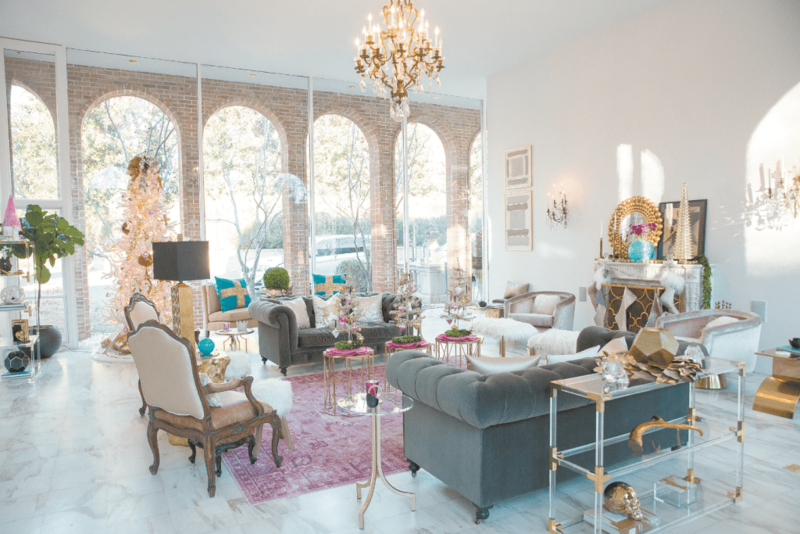 Stepping into the Kaple home, visitors will notice floor-to-ceiling windows, arched doorways and stately columns. The light-filled house is decorated with Tuscan pottery, European tile and antiques. To the right of the foyer is a formal living, complete with a large tapestry and chandelier. To the left, a large dining table is decked out for a holiday meal. A winding staircase leads up to the second floor while an iron gate separates the foyer from the kitchen area. Two islands in the gourmet kitchen provide plentiful countertops for baking cookies, a favorite activity for the Kaple girls. The family also enjoys snuggling up to watch movies in their media room, which is tiered for better viewing from leather couches. Upstairs, the girls’ bedrooms are decorated with delicate fabrics in subtle, calming colors. Throughout the rooms and hallways, large cheerful photographs hang, celebrating each of the children. At Christmastime, the Kaples’ living room is home to a 14-foot tree, flocked to look as if it’s dusted with fresh-fallen snow. Their second tree, trimmed in red and gold, displays ornaments the girls have made. On Christmas Eve, the children sprinkle “reindeer food” in the courtyard and gather to read the Christmas story. The Yancey Home. Photo courtesy Samford University. Danielle and Bart Yancey’s names may sound familiar to some past patrons of league home tours; their previous home in Vestavia Hills was featured in 2013. But while the Yanceys’ names may be familiar, their new house has little in common with their former farmhouse dwelling. 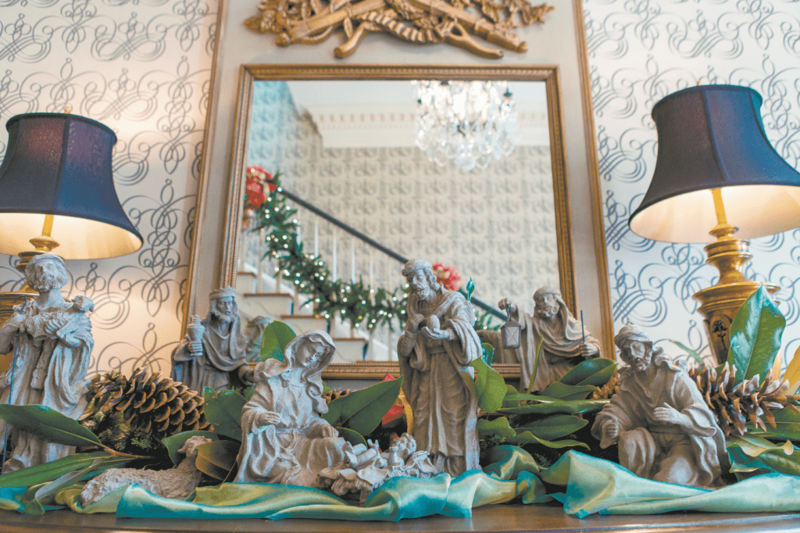 The décor in the Yanceys’ residence in Mountain Brook has a more modern and glamorous Palm Springs flair. The house, built in 1963, was designed for Kitty Ireland by architect Fritz Woehle, who based the structure on the configuration of a Roman basilica. More than 20 years later, Ireland’s granddaughter added to the house, installing an engraved stone to mark the divide between old and new. The main walls are glass bordered by brick archways, which surround a grand courtyard and pool. At the back of the house, an enormous round window frames a view of the space. The Yanceys contracted with Richter Landscape Company to establish a master plan to be implemented over time. The entire residence is floored with Alabama white marble, the veins varying by room, which provides a clean backdrop for the décor. An aficionado of vintage aluminum Christmas trees, Danielle is displaying several of various sizes and colors this season. One tree is dedicated to Trooper, their rescue dog. Another is decorated with white ornaments crocheted by Danielle’s mom and angels painted by Danielle and her dad. The Prewitt Home. Photo by Chris Luker. 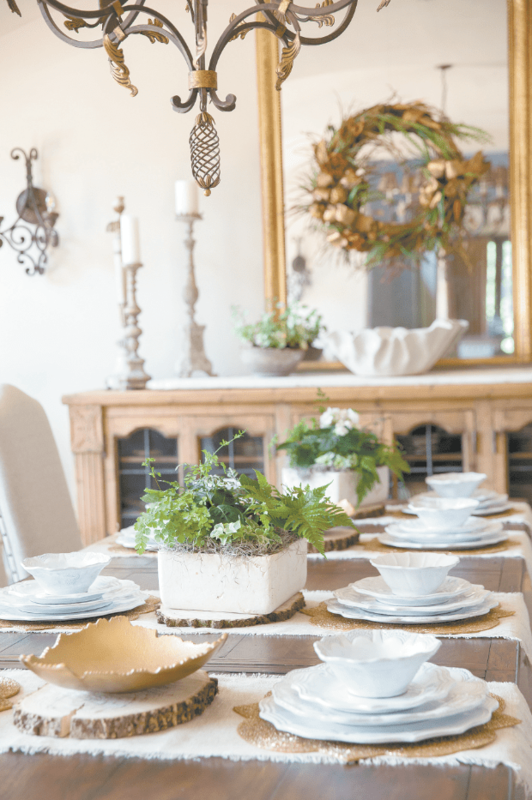 When Ashley and Andy Prewitt bought their Vestavia Hills ranch in 2003, they knew that one day they’d undertake a major renovation. Thirteen years later, that day came. “It started as a bathroom addition,” laughed Tom Adams of Adams Gerndt Design Group, who worked closely with the Prewitts on their renovation design. With a goal of crafting “an English cottage feel,” Adams and his partner, Adam Gerndt, suggested they add an exaggerated gable and large limestone bay window. In addition to raising the roof significantly, the design included refacing part of the home with brick. To accommodate the change from siding, a new footing was added around the house. According to the builder, David Sherrod of BRBC Construction, the effort was worth it. The new cedar shake peaked roof allowed for a high vaulted ceiling in the center of the home, creating an open living and kitchen area. With lots of natural light and a large kitchen island topped with Carrara marble, the great room is bright and welcoming. Double French doors open to a screened porch, which in turn leads to an outdoor dining area with a rustic stone fireplace. Overlooking what is now the 14th fairway of Vestavia Country Club’s golf course, the Prewitts’ home has beautiful views from nearly every vantage point. As the Prewitts decorate in preparation for the home tour, they will be remembering Ashley’s recently deceased mother, who loved Christmas. “We know it’s no coincidence our home is on the tour this year,” Ashley said. The Stephens Home. Photo courtesy Tracy Stephens. With views of Double Oak Mountain from two-story windows, the Stephens’ home in Vestavia Hills bears little resemblance to the ranch that once occupied the lot on Sheridan Drive. To create the transformation, Tracy and Robert Stephens engaged Adam Gerndt and Tom Adams of Adams Gerndt Designs. Tasked with honoring the mid-century modern look of the original house, they incorporated deep overhangs with brackets and corner windows. Adding a second level, they framed the mountains in tall windows. Having four active children, a dog and a heart for hospitality, the Stephenses wanted an open floor plan to accommodate a crowd. The bulk of their new house is in the living space, designed and furnished to be inviting, comfortable and functional. With Alabama white marble on the perimeter countertops and Alabama limestone on the large island, the kitchen is bright and airy. Tracy wanted everything to be “clean but accessible,” so the refrigerator, dishwasher and ice maker have paneled fronts that match the cabinets. An appliance garage hides smaller appliances, keeping the countertops uncluttered. Adjacent to the kitchen is an open dining area and a large living space with plenty of room for friends and family to gather. Flanked by three floor-to-ceiling windows on one side and double French doors on the other, the room is filled with natural light. A limestone fireplace with herringbone tiles anchors the space, creating a visual connection to the kitchen island. Reclaimed, hand-hewn oak timbers from a dairy barn in Kentucky add depth and warmth to the room, which opens to the back patio and yard. Overlooking Shades Valley and Samford’s campus, the Samford President’s Home on Shades Crest Road is at the peak of Shades Mountain in Vestavia Hills. With elegant furnishings, lush landscaping and the view, the home welcomes nearly 10,000 visitors annually. The main level of the house is open to the public during the tour. Visitors will see five Christmas trees, each thematically decorated. Among Jeanna Westmoreland’s favorites is the one dedicated to Chrismons, Christian symbols crafted in white and gold. Also displayed throughout house is the Westmorelands’ collection of nativities, gathered during their travels to international locations. Garland with twinkling lights adds a festive touch to the two stairways, while more than 100 nutcrackers of all sizes adorn the bookshelves and mantles. On the day of the tour, the house also will feature a holiday gift market and holiday treats. The gift market, set in the ballroom, features merchandise from more than a dozen merchants, including art, jewelry, soaps, knitted items, specialty olive oils and photographs. Stepping out of the ballroom into a heated tent provided by Pre Event Resources and Tailgate Guys, guests will discover an array of hors d’oeuvres and sweet treats donated by local businesses and league members. Pianists will be playing as visitors shop and snack. 2018 Christmas Home Tour Committee, front row, from left: Julie Cundiff, committee manager; Lisbeth Cease, co-chair; and Terre Currey, co-chair. 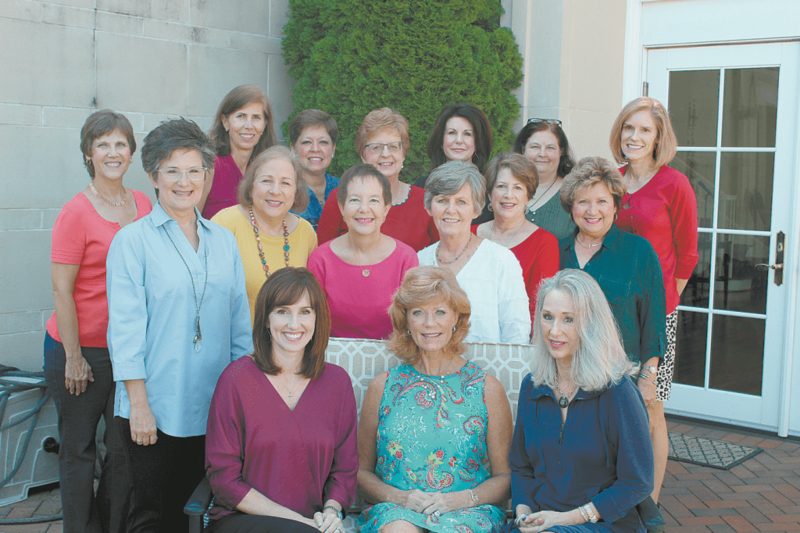 Second row: Jeanna Westmoreland, Mary Margaret Yeilding, Cheryl Landreth, Ginny Scott, Jan Service and Harriet Williams. Third row: Janie Howell, Sharon Smith, Kathy Clay, Ginger Brown, Phyllis Crocker, Pam Matthews and Inga Clum. Not pictured: Melinda Mitchell, Sheila Smith and Allison Strickland. Photo courtesy Samford University. The Legacy League’s annual Christmas Home Tour raises funds to provide scholarships for students with significant financial need and challenging circumstances. Many of the organization’s scholarship recipients have faced obstacles including the death or disability of a parent, foster care, inner city violence, parental job loss, homelessness, abandonment and full-time ministry in a remote place. To date, the Legacy League has awarded more than $800,000 in scholarships to help nearly 180 students attend Samford University. The league is a volunteer organization with more than 750 members. More than 250 volunteers worked on this year’s home tour, for which ARC Realty is presenting sponsor again this year. “The Legacy League’s Christmas Home Tour is one of the most rewarding events that we participate in yearly, and it is gratifying to know that we are helping young people receive a great education and be in an outstanding environment.” said Beau Bevis, ARC Realty CEO and qualifying broker. Premium sponsors are Adams Gerndt Design Group, AllSouth Appliance Group, Apex Valet/Rare Transportation, BRBC Construction, First US Bank, Long-Lewis Ford, Richter Landscape Company, Tailgate Guys and Pre Event Resources. Sharon Smith is Samford University Legacy League Director of Development. Tickets: $25 in advance through Dec. 4 at samford.edu/legacyleague; $30 at the door of featured houses during tour hours. Parking: Parking is available at each of the Vestavia Hills homes. For the Mountain Brook homes, park at Philadelphia Baptist Church’s property on Pump House Road. Shuttles will run during tour hours.